Our flight to the North Island left in the afternoon and landed in the evening. There wasn't much around in the way of food other than fast food places, so a Subway and a McDonalds had to suffice. We took them back to the Formule 1 Hotel which was a welcome relief from the van for a night. It was very clean and comfortable and had everything other than free wi-fi, but we could live without that. We left the F1 Hotel and picked up our new van from Britz at 10am the next day. Despite us booking a Backpacker (budget range), they had kindly upgraded us to a Britz (mid-range) for free. We ended up with the same van we'd shared with Paul and Fi on our Australian west coast road trip. After spending so long in a similarly sized van in the South Island, I have no idea how we managed to put four people into it a couple of months ago. As much fun as it was, it was very cosy and I think we've since been spoiled by the amount of room we had. Unfortunately, we were now in a petrol automatic; unlike our super-efficient diesel in the south, this one managed to get through half a tank in a day. Since we were in Auckland, we'd been recommended the World Press Photographer 2012 exhibition by Paul and Fi, who had seen the 2011 show (we missed it in Kuala Lumpur by a week) and had loved it. Gilly prefers photography exhibitions to a lot of art galleries, and I'm certainly starting to share that view. These shots were superb. The majority focused on the main four events of the last year: the Arab Spring, the Christchurch earthquake, the Japanese tsunami and the Norway massacre. Some were graphic, some poignant, all emotive. There were small groups as well: a set of six photos of a man caring for his wife who was afflicted with Alzheimer's (they had been married 65 years, and he insisted on staying with her at home...devastating); a deeply disturbing portrait of child brides in Afghanistan, Ethiopia, India, Nepal and Yemen who had been married to middle-aged men when their ages were barely into double digits; a brutal look at the effects of the drug wars engulfing Mexico - one photo taken in Acapulco showed a group of body parts, including a severed head, which had been found in the trunk of a car; a series showcasing the effects of the financial crisis engulfing Americans, in which millions have been evicted due to their inability to keep up with rent or mortgage repayments; a group highlighting the plight of the rhinos being hunted to extinction (it is now at the stage where vets are removing the horns themselves in order to make them less appealing to poachers) . There's only so much you can comprehend by just reading words on a particular news piece, sometimes you need a photograph to put things into context. It was a superb exhibition and well worth an hour of anyone's time. We had lunch at the superb Food Alley, a selection of reasonably priced stalls of all flavours: Vietnamese, Thai, Turkish, Indonesian and more. It was the closest thing we'd come to a hawker stall since leaving Singapore, and it was magnificent. I ordered Com Ban Xo (spicy chicken with rice, chilli and veg) from the Saigon stall and asked for it hot. It didn't disappoint, and 25 minutes later I couldn't feel my lips. Gilly had picked Nam Tok (spicy pork with coriander and chilli) from a Thai stall and had it medium. The last time we'd had this was Koh Tao, and whilst it was a good effort it didn't match the brilliance of the rotund lady's magic recipe on the Thai island. It was probably a good thing Gilly didn't ask for it hot - between the two of us we got through 1.5 litres of Coke and Sprite in half an hour. Gilly had spotted an advert for the Wildlife Photographer of the Year 2011 exhibition on the way to lunch. This was something of a ritual for us when we lived in Bristol, as we'd go and see it every December at the museum. Obviously we were in Vietnam at the same time last year so missed it (oh, the trials of the traveller!) so I was really happy to get a chance to see it. It was housed in Auckland Museum, and seemed to contain more entries this year. The winner was a group of pelicans covered in a film of oil after the BP oil spill last year. An excellent picture with a relevant environmental message, but not the shot that I’d have chosen as the winner...then again, this is the case each year. There was a superb photo of a cheetah and her six cubs up a tree which was fantastic. I’m completely biased, as I love cheetahs. They’re possibly my favourite wild animal, and seeing a cheetah chasing and catching prey in the Serengeti is definitely one of the top items on my bucket list. It’s my parents’ fault for getting me a BBC wildlife video when I was about 7 entitled “The Fastest Thing on Four Legs”. If there was ever a film that exposes kids to the brutality of nature, this is it. It followed a cheetah called Mara and her cubs, who faced a daily struggle for survival. We got to see the chase, the kill and the bone-crunching gore as they ate. If that wasn’t enough, some of the cubs never saw the end of the film as they were taken off by predators unknown, and then the icing on the cake came after Mara abandoned the rest of her kids to fend for themselves once they reached the right age. Traumatic stuff. To sum up then, the cheetah photo should have won and the judges got it wrong. 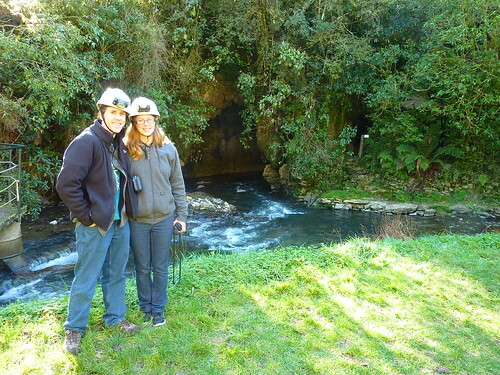 We drove to Otorohanga Holiday Park in the evening, as the town was close to Waitomo and its many caves. Here, you can do blackwater rafting (it’s like whitewater rafting, but in a cave), abseiling, and more. 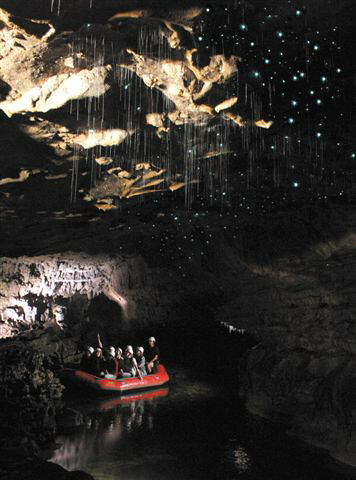 After some thought, we decided against doing anything too adventurous the next day and opted for a glow-worm tour with a company called Spellbound. The tour took about three and a half hours. The company takes a maximum of 12 people which was ideal as we wanted to avoid huge groups. In the end there were 5 of us and our very knowledgeable guide, Norm. He is a lifelong caver, so if there’s anything you want to know about fault-lines, geology or potholing, he’s the man to talk to. 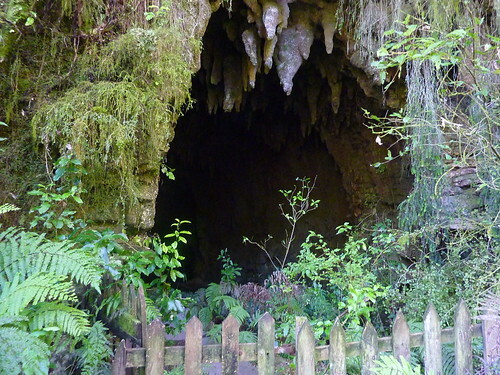 After a 25 minute drive we got to the first cave Te Ana o Te Atua, or the Cave of the Spirit. 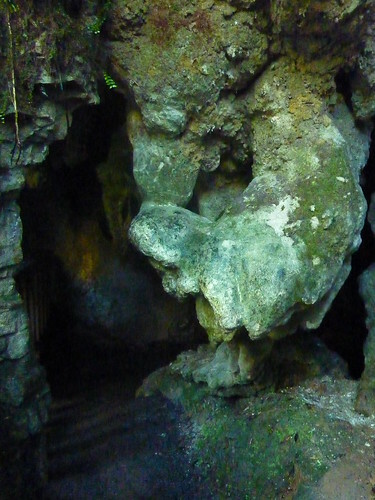 The natural shapes carved out by the water flowing through are impressive. 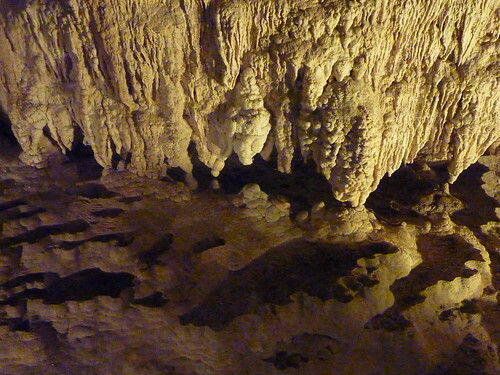 The cave still floods twice a year. 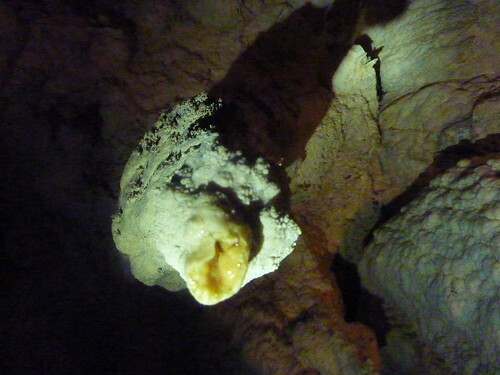 I also never realised stalactites were hollow. I guess it makes sense once you think about it – how else would the calcium-rich water build up? 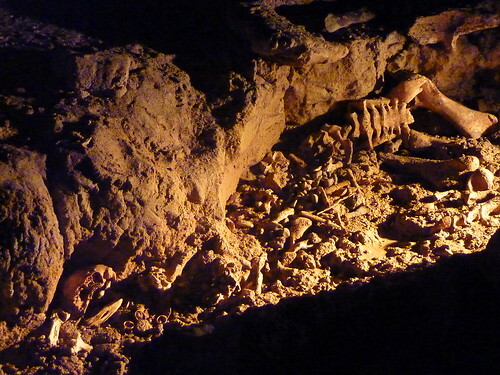 The bones of a moa bird were found in the cave; the moa became extinct due mainly to them being particularly tasty, which is possibly not the best trait to have if you want to survive. 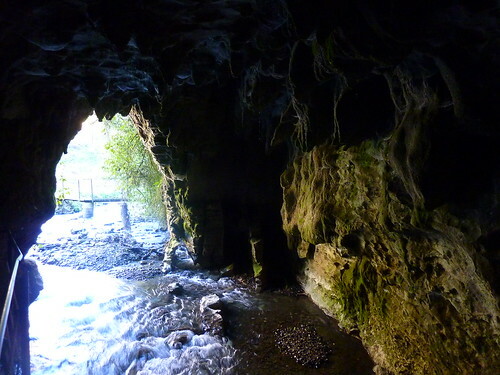 After a short break for some tea and biscuits, Mangawhitikau Cave was our second destination. We got kitted out with a headtorch and helmet (a useful accessory as I smashed my head into rocks a mere 30 seconds after putting it on, thankfully bruising only my ego). 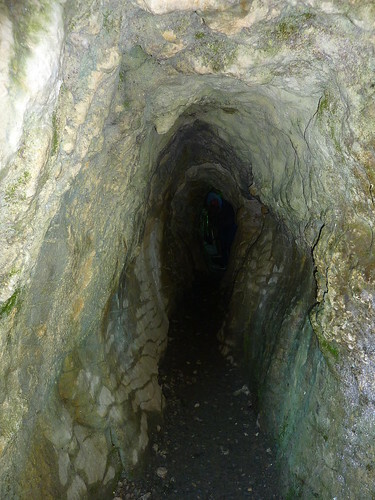 After a short walk of about 20 metres into the cave, we turned off our headtorches and were in pitch black. Our eyes soon accustomed, and shortly after we were introduced to the glow-worms. These aren’t actually worms, but maggots. I guess “glow-maggots” doesn’t have the same tourist appeal. They dangle sticky threads down, and then shine a light out of their arse to attract gullible prey (a bit like Blair and Cameron, then). The flies get caught in the threads and the glow-worms reel them up to eat. I’m not entirely convinced that the barnacles creatures in Half-Life weren’t based on glow-worms. Once the maggot goes into a chrysalis and hatches into a fly, it has about 4 – 6 days to live, as it has no mouth to feed. Bit of a design flaw there, I feel. 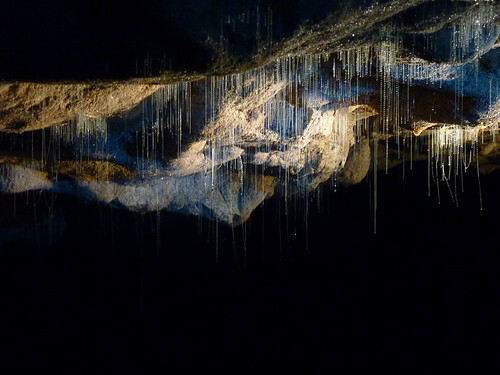 We were taken to a dinghy and Norm then pulled us along via an overhead rope to see the millions (no, literally) of glow-worms on the ceilings and wall overhangs. Our cameras simply weren’t up to the task of capturing the blighters despite them casting enough light for us to see each other, which was bizarre. Thankfully, Spellbound were kind enough to send us some photos for the blog. The experience was bizarre, yet fascinating. It was like looking up at a miniature solar system made up of millions of bugs waiting to feed. 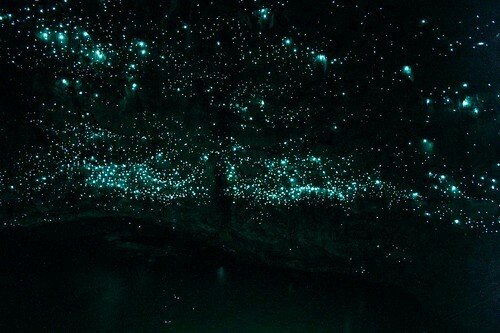 According to Lonely Planet, the glow-worms that shine the brightest are the hungriest. The Lonely Planet needs new researchers, as the luminosity is actually down to the age of the glow-worm – the older they get, the brighter they shine. 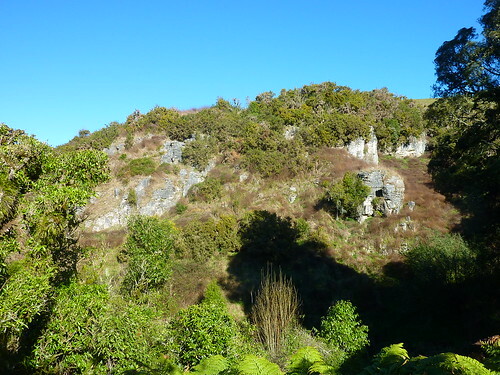 We took a walk back to the van from the cave, over some very picturesque scenery. I could quite imagine hobbits being taken to Isengard over these hills. It looks a lot like England, but with actual sunshine and less chavs littering the place with fag ends and beer cans. After lunch we went on the Ruakuri Bushwalk, a 30 minute round trip which took us through natural tunnels, past waterfalls and over streams. All in all, a quite wonderful nature trail. We ended up in Waiteti Trout Stream Holiday Park in the evening, about 5km outside of Rotorua. 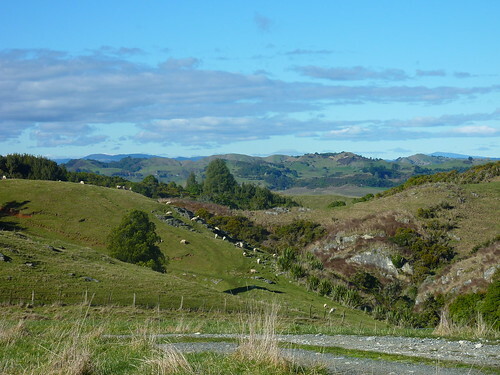 We were going to visit a Maori village the next day, complete with geysers and mud pools.